A partnership of Raymond Mays & Partners Ltd. , BRM and Rubery Owen of Darlaston. and the other " Cordon Bleu" in gold letters on a blue background in exchange for support from the drinks company. Whilst being a major part of the ERA and BRM racing teams he also was involved in a car dealership and developing a road car just before World War Two. The conversion packs were available in several versions for use with four or six cylinders and used one, two or three carburettors depending om the versions. Consul Mk1  4 cyl. Zephyr Six (or Zephyr Mark I)  6 cyl. Zephyr Zodiac (or Zodiac Mark I) 6cyl. Zephyr Mark II  6 cyl. Zodiac Mark II  6 cyl. Zephyr 4 Mark III  4 cyl. Zephyr 6 Mark III  6 cyl. 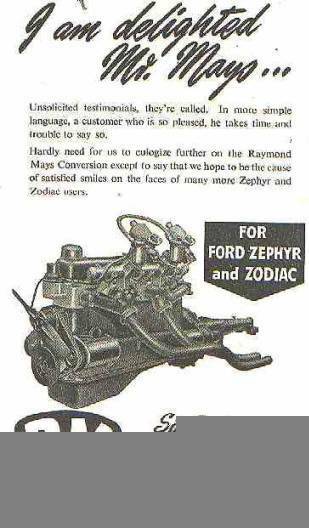 This advert raises a question of how the work and profits were shared between Raymond Mays & Partners Ltd. , BRM and Rubery Owen of Darlaston. 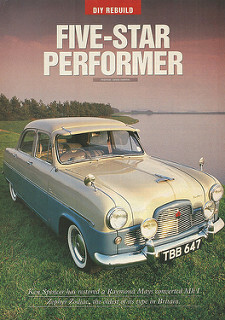 Pages 10-13 cover the restoration of a Mk.I Ford Zephyr-Zodiac with a Mays cylinder head conversion by the Spencer family. 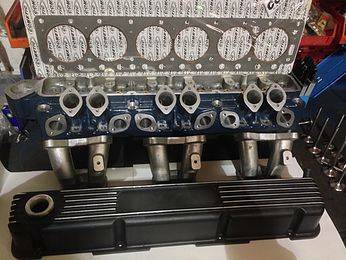 "The new Raymond Mays cylinder head produced by Chesman Motorsport & Iain Daniels Classic Motorsport has more power than the original,with Bronze Valve Guides, Modern Chamber Design and high grade materials. The pattern equipment was produced by Chesman Motorsport as well as all the machine work and fine finishing."